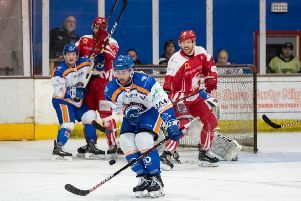 Player-coach Tom Norton insists Phantoms will fight for every point in the NIHL Division One South title race. 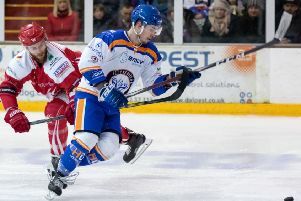 The defenceman refuses to believe that a home defeat at the hands of table-topping Swindon last Sunday was a fatal blow to the city club’s chances of lifting the league crown. Phantoms remain third in the standings and now trail their pacesetting conquerors by five points which means that even victories in their two games in hand would not be enough to leapfrog the Wildcats. But Norton is confident Phantoms can still challenge for glory during what promises to be an exciting run-in with 10 games still ahead. “We picked up two very good points in Basingstoke last Saturday and it was frustrating not to be able to follow that up with another win against Swindon,” admitted Norton. “But we are still in the title race and we will do all we can to earn up as many points as possible. “That has been the goal all season and it’s not going to change now. “There are a lot of important games ahead and the situation at the top of the table will change regularly. Phantoms will find it difficult to ignore events elsewhere this weekend as the two teams above them in the standings - leaders Swindon and reigning champions Basingstoke - do battle on successive nights. But the city men have a couple of tough missions of their own as they face back-to-back road trips. They go to Streatham on Saturday (5.30pm) before heading back towards the capital to take on Raiders on Sunday (5.30pm). Norton added: “Streatham are a dangerous team - especially in their own rink - and we know all about the quality Raiders have as well. “It’s going to be a tough weekend but I’ve said many times that every point and every victory has to be earned in this league. “Playing two away games in a weekend is not something that happens too often, but we have to adapt to it and ensure we perform to the level we know we’re capable of playing at.